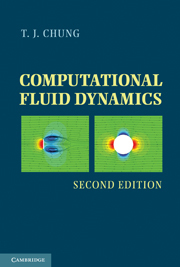 The second edition of Computational Fluid Dynamics represents a significant improvement from the first edition. However, the original idea of including all computational fluid dynamics methods (FDM, FEM, FVM); all mesh generation schemes; and physical applications to turbulence, combustion, acoustics, radiative heat transfer, multiphase flow, electromagnetic flow, and general relativity is still maintained. This unique approach sets this book apart from its competitors and allows the instructor to adopt this book as a text and choose only those subject areas of his or her interest. The second edition includes a new section on preconditioning for EBE-GMRES and a complete revision of the section on flowfield-dependent variation methods, which demonstrates more detailed computational processes and includes additional example problems. For those instructors desiring a textbook that contains homework assignments, a variety of problems for FDM, FEM, and FVM are included in an appendix. To facilitate students and practitioners intending to develop a large-scale computer code, an example of FORTRAN code capable of solving compressible, incompressible, viscous, inviscid, 1D, 2D, and 3D for all speed regimes using the flowfield-dependent variation method is made available. Part I. Preliminaries: 1. Introduction; 2. Governing equations; Part II. Finite Difference Methods: 3. Derivation of finite difference equations; 4. Solution methods of finite difference equations; 5. Incompressible viscous flows via finite difference methods; 6. Compressible flows via finite difference methods; 7. Finite volume methods via finite difference methods; Part III. Finite Element Methods: 8. Introduction to finite element methods; 9. Finite element interpolation functions; 10. Linear problems; 11. Nonlinear problems/convection-dominated flows; 12. Incompressible viscous flows via finite element methods; 13. Compressible flows via finite element methods; 14. Miscellaneous weighted residual methods; 15. Finite volume methods via finite element methods; 16. Relationships between finite differences and finite elements and other methods; Part IV. Automatic Grid Generation, Adaptive Methods and Computing Techniques: 17. Structured grid generation; 18. Unstructured grid generation; 19. Adaptive methods; 20. Computing techniques; Part V. Applications: 21. Applications to turbulence; 22. Applications to chemically reactive flows and combustion; 23. Applications to acoustics; 24. Applications to combined mode radiative heat transfer; 25. Applications to multiphase flows; 26. Applications to electromagnetic flows; 27. Applications to relativistic astrophysical flows; Appendices.